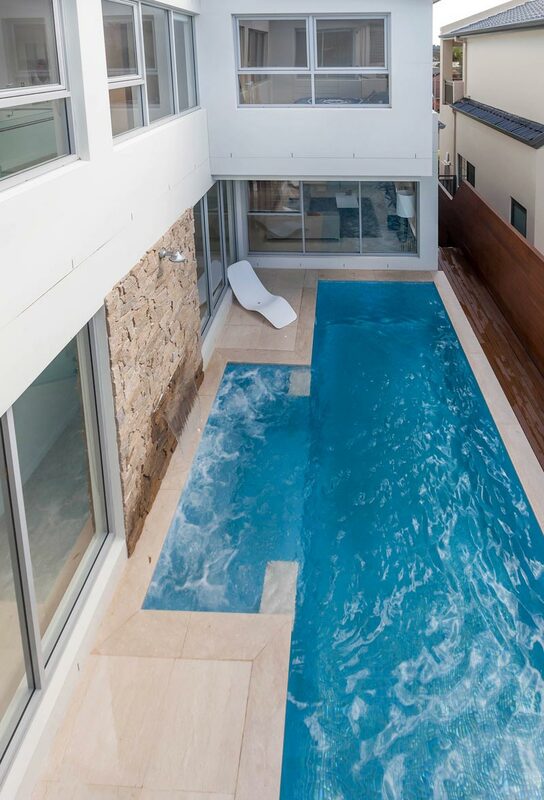 The Wall House was created with a swimming pool literally floating over the top of another swimming pool. One is located on the ground floor next to an entertaining patio while the other is suspended above it with a glass bottom looking down to the floor below. The design gives swimmers the feeling that they are floating in mid-air. So spectacular are the results that Conde Nast has voted it among the top ten swimming pools in the world. The design gives swimmers a surreal experience, either looking up at swimmers above or looking down at swimmers and the patio below. The concrete, glass and timber home which is open to the outdoors, gives home and swimming pool integration a whole new meaning. The two perpendicular swimming pools, designed by Guedes Cruz Architects, are the focal point of the stunningly sophisticated home perched on a golf course along the Mediterranean coastline. The landmark property symbolises a castle designed with isolation from the neighbours and protection from the strong Atlantic winds in mind. The raw materials and stark design lines are softened by walls covered in plants and the beautiful surrounding landscape.